Last week, I shared this photo of some pendants I was working on, using ICE Resin. 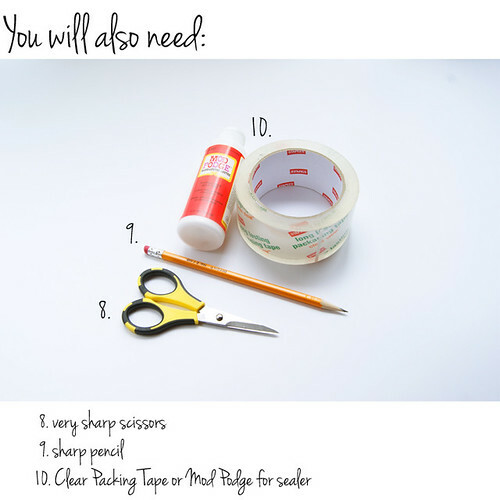 Due to the excited response from many people who have wanted to try this material, but haven't quite mustered up the courage, I decided to create a tutorial to share. This is a wonderful product that has enormous potential, and I encourage you to give it a try! 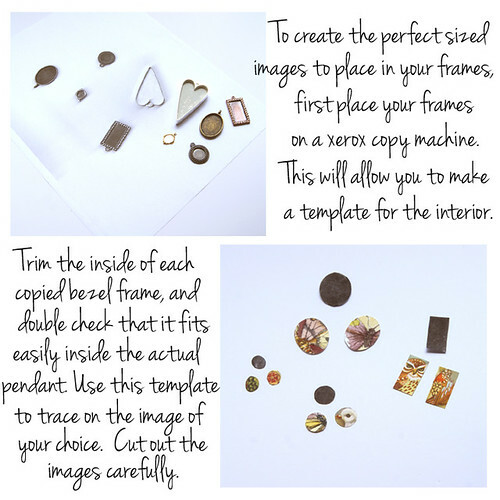 Once you have all of your images sealed and trimmed, make sure they still fit nicely in your bezels. If they are too small, a good remedy is to use your acrylic paints to paint the inside of the bezel in a color that coordinates with the image. If they are too big, you may be able to burnish the image in. If it still pops up, you will have an air bubble problem, so you will have to re-trim. 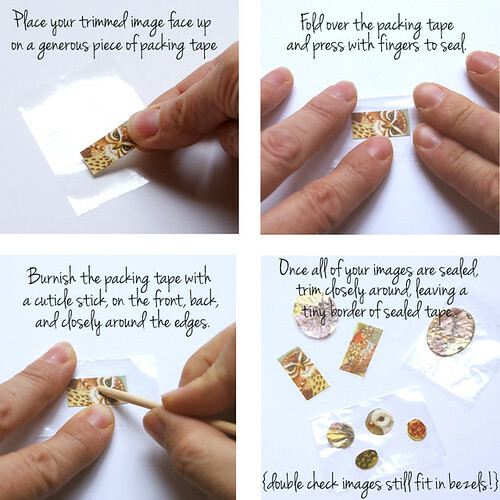 You will also have to make sure you reseal your image. If you have used the xerox technique, you should be able to avoid this problem. 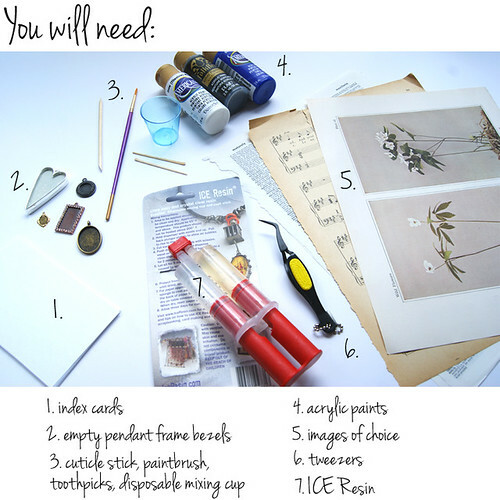 I hope you try working with ICE Resin- it really is a great way to customize your jewelry. Have you worked with other resins? I'd love to hear about your experience! Fun tutorial, Erin. I've been working with ICE as well as other resins. It's so much fun! I loved your tip about putting the bezels on the copier. Hadn't thought of that! Thanks so much. A video tutorial - this is so coooool, Erin!! Well done -it looks great, very well explained, lots of useful tips! Thank you ladies! I should have included that I am no videographer (yet!) There was just no way I could show you how to pour the resin with still photos... so I had to jump into video! It's always a learning process! Since i rarely, if ever, make jewelry, I probabluy won't make use of this tutorial. But i have two things to say! First the tutorial is very well done! These things take so much time and work and i know your readers will truly appreciate your efforts. And secondly - I LOVE that owl! Totally cool owl. Templates, well, that idea alone was worth watching the vid and reading! But all in all, this is a def watch vid - well done, nicely edited, and you could've fooled me that you aren't a videographer! Thank you for taking the time to do the vid and blog post. It'll come in very handy! Thanks Holly and Pam! I struggled for a bit getting those images to fit- so this was the best solution I could come up with, and it worked like a charm! Erin---this is a great tutorial! I love the idea of photocopying the bezels. A really easy to follow lesson! Thanx for posting! Jane, the heat gun was a craft heat gun. You can find them in the scrapbook section. They are typically used for embossing powder. Thanks for stopping by and asking! thank you!! 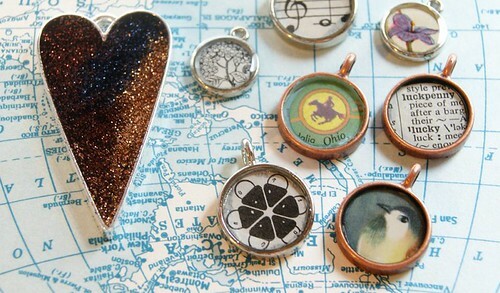 you made it seem like my idea of making pendant gifts for friends might actually be doable!! :) really gorgeous jewelry and artwork!! I'm a late Bloomer! Thank you so much for this invaluable information!